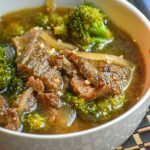 The classic flavors of the beloved Chinese take out dish, we've given this dish a fun new twist by turning it into rich, savory soup. In a large mixing bowl, add the steak strips seasoning liberally with freshly cracked back pepper. Add in the corn starch and soy sauce, tossing to combine. Cover the mixture and let it marinate for 10-15 minutes. Heat a dutch oven, or other sturdy soup pot, over medium high heat. Add half of the olive oil. Once the oil's hot, which won't take long, add half of the prepared steak, spreading it out in a single layer. Sear the meat for 45 seconds to a minute without stirring. Flip all of the meat and cook for another 30 seconds, until it's barely cooked but very tender. Transfer the meat to a clean plate, including any juices, and cover with foil. Repeat these steps with the second half of the uncooked steak. Keeping the pot over medium high heat, add in the onion and garlic. Stir in a half cup of beef broth, and season with the ginger and salt, to taste. Use the broth and a sturdy spoon to deglaze the pan, scraping up all the flavorful browned bits stuck to the bottom. Stir in the rest of the beef broth and the broccoli florets, turning the heat up to high to bring the soup to a boil. Once the soup's boiling, stir in the oyster sauce and chili paste. I'd taste test before adding the second tablespoon, especially if you aren't familiar with cooking with it because it is spicy. Let it cook for 2 minutes- until the broccoli's just softened, but still crisp. Adjust salt & pepper, if needed. Remove the pot from heat, stirring in the cooked meat and any juices. Serve & enjoy!